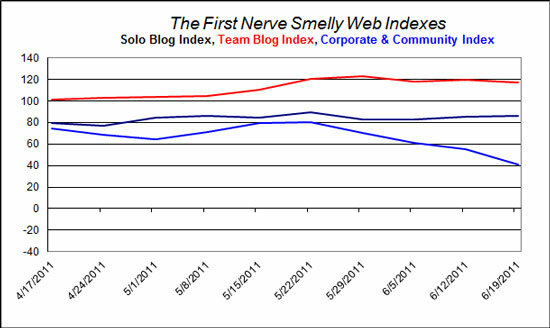 I love your willingness to chart the viewership of the different kinds of blogs. I'm wondering if some kind of macro-trends will be revealed by following this micro sampling. 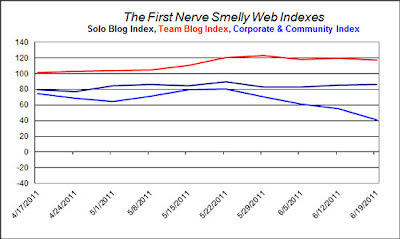 You worry about your numbers but yours is a consistently top-rated site. It's weird how traffic rankings become a proxy for audience and therefore a moral reproach: "My numbers are down; I must not be working hard enough." I have no idea how or why my blog rankings go up or down, and I think Alexa is a bit wonky because it never reflects if I have a big media hit event, or if I'm on vacation. I've compared my site-meter numbers to Alexa traffic rankings and found that they follow each other over the long term (i.e., months). There is also a lag in Alexa; a big couple of weeks will show up in Alexa a couple of weeks later. Finally, my impression (haven't done the analysis to back it up) is that Alexa is rate sensitive: if you're on a downward trend, ALexa pushes you even further down, and a string of good weeks buys you an extra lift.